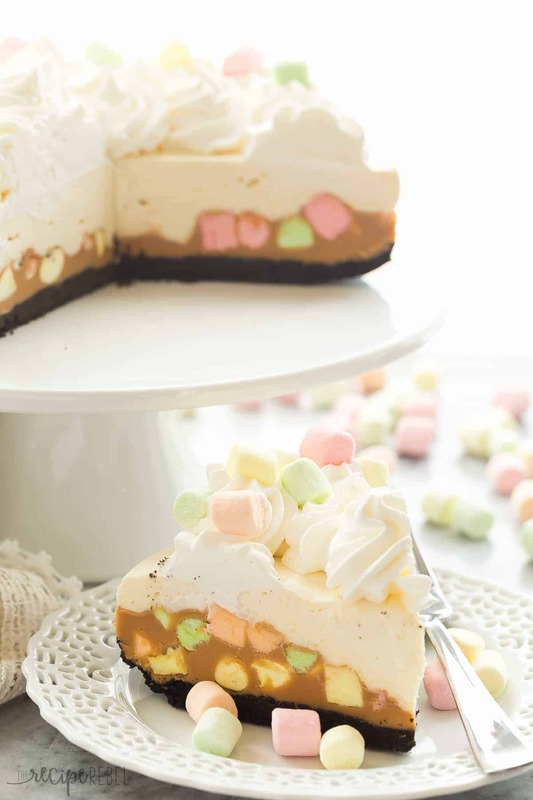 This No Bake Peanut Butter Marshmallow Square Cheesecake is a fun twist on a classic Christmas square! It’s an easy dessert your guests will be raving over! Includes step by step recipe video. Friends. Those Peanut Butter Marshmallow Squares you all know and love (or hate?!?)? Well they’re getting a makeover in a big way today. 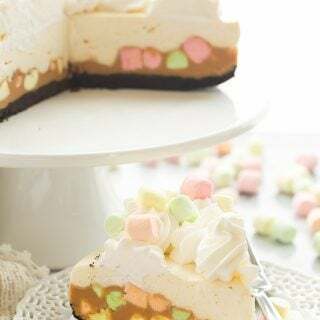 So let me first say that this was not actually my idea at all — I saw a photo of some Peanut Butter Marshmallow Square Cheesecake genius on the Bothwell Cheese instagram feed, and I’ve been set on making my own version for the holiday season ever since. The original idea (I believe) comes from Chew Catering in Winnipeg. Since I never actually got around to trying the original, this is my own — also incredibly delicious — version and I hope you guys like it! There is just something about peanut butter and butterscotch that gets me every time, regardless of what it is I’m eating. And now I feel it’s my mission to make every one of my holiday favorites in cheesecake form. I hope you guys can get behind me on this one? Because the holidays are over too quickly to go without ? 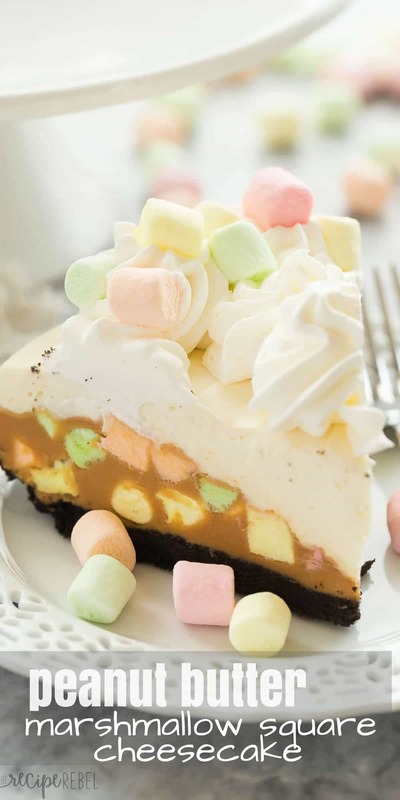 If you are actually just looking for a Peanut Butter Marshmallow Squares recipe, you can in fact just leave off the cheesecake. Just don’t tell me you did ? To make gluten-free, simply leave off the crust and just use the squares as your base. This cheesecake is a great make ahead dessert, as it is best when refrigerated overnight before serving. To make the crust, combine cookies and butter in a food processor and process until finely ground. Press into the bottom of a 9″ Springform pan. Set aside. In a large microwave-safe bowl, combine butter, peanut butter and butterscotch chips. Microwave on high, stirring each time, for 15-20 second intervals until melted and smooth. 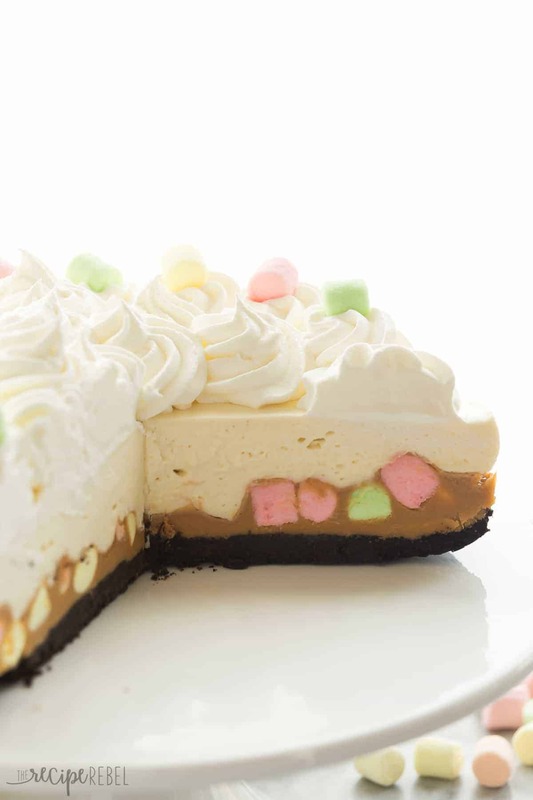 Stir in marshmallows and spread over cookie crust in pan. Refrigerate or place in the freezer to set. Add the cream, sugar and vanilla and beat on high until light and fluffy, 3-4 minutes. Spread over cooled marshmallow square, cover, and refrigerate at least 5-6 hours or overnight until completely set. Serve.